Hives affects over 60 million Americans at some point in their life. Between allergies, stress, and even different climates, hives can manifest for hundreds of different reasons. But now there's a way to fight against these breakouts and get fast, soothing relief from the comfort of your own home. Our all-natural formula uses the highest quality ingredients available today, and contains powerful, yet gentle, in ingredients to get you the results you want without the side effects you hate. when hives strike, and you feel that itching start, there's only one product out there that can help you reclaim your healthy skin. This safe, natural, and efficient solution can help you relieve all of the stubborn symptoms you hate. Our researchers have put together the optimal formula that can help fight against: Itchiness, Redness, Irritation, Pain, and Swelling. With quality ingredients and a precise formula, there's no better hives solution out there than OxyHives Hives Relief. Tired of putting questionable chemicals into your body? 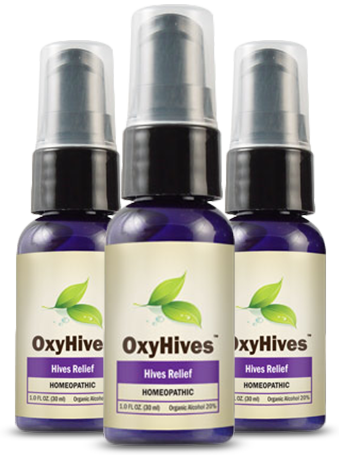 OxyHives is a topical homeopathic solution that is safe for you and your skin. Don't bother with messy cream, or pills that can make you drowsy or nauseous! OxyHives is the safe, relivable way to get you the relief your skin needs. OxyHives is the real deal! I love it! "I bought OxyHives just over 2 months ago and I can’t rave enough about how well it works. Highly recommended to anyone looking for relief!" "OxyHives is doing something right! I don't know if it's the quality of the ingredients or the formula itself, but I've never found a product I like better." Felt it going to work nearly instantly! 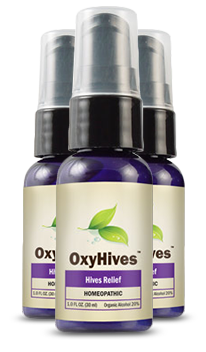 "I've been suffering from hives ever since college and OxyHives is the only solution that works for me. It simply does wonders for my skin." Using natural-based products can be a very useful way to handle mild hives and a useful adjunct for more significant hives outbreaks. "OxyHives is doing something right! I don't know if it's the quality of the ingredients or the formula itself, but I've never found a product like better." "I've been suffering from hives since college and OxyHives is the only solution that works. It does wonders for my skin." Hives affects over 60 million Americans at some point in their life. Between allergies, stress, and even different climates, hives can manifest for hundreds of different reasons. But now there's a way to fight against these breakouts and get fast, soothing relief from the comfort of your own home. Itchiness, Redness, Irritation, Pain, and Swelling. With quality ingredients and a precise formula, there's no better hives solution out there than OxyHives Hives Relief.